electrical stores, receiving and checking of goods on delivery,preparing orders for delivery to clients and carrying out regular stock taking. Prospective candidates will also assist in the operation of the Electrical Trade Counter which includes the manning of this Point of Sale when necessary and in giving support. Applicants having experience in similar work and knowledge in electrical products will be preferred. 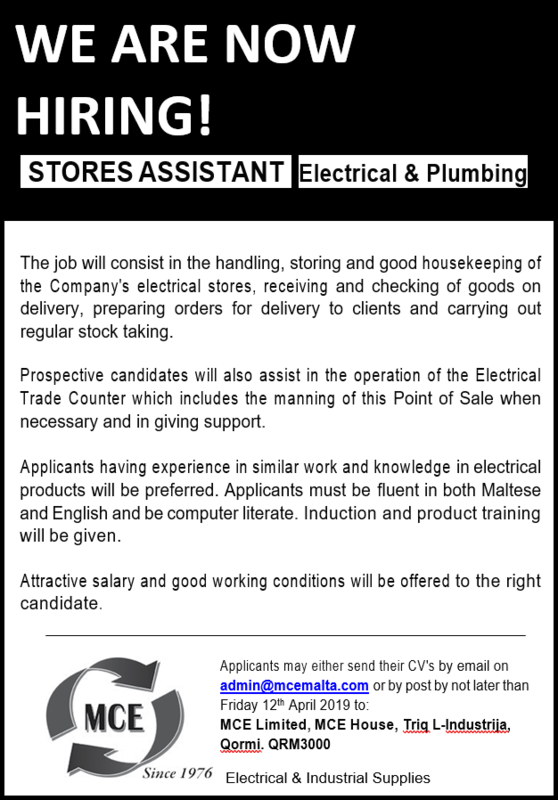 Applicants must be fluent in both Maltese and English and be computer literate. Induction and product training will be given. Attractive salary and good working conditions will be offered to the right candidate.